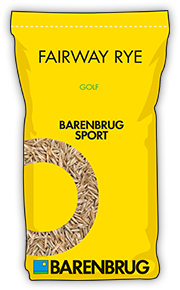 FAIRWAY RYE is a mixture of four grass species and sub-species, designed for the overseeding, divoting or construction of a balanced blend of medium-fine turf across a range of soil types. The “driver” of the mixture is 40% Barcristalla perennial ryegrass. Barcristalla is a medium-fine ryegrass with excellent wear tolerance and superior colour. It is well ranked on both S1 and L1 BSPB/STRI tables. The red fescue cultivars in the mix are all consistent performers, and are all ranked highly in the BSPB Turfgrass Seed booklet. Of particular note is the outstanding red thread tolerance of Barpearl, an important factor in fairways under low nutrition.